Scientists at Tokyo Tech, Ricoh co. and The National Institute of Advanced Industrial Science and Technology have developed an ultra-low-power atomic clock (ULPAC) for small satellites to enable future communication systems beyond 5G. The proposed device outperforms the current industry standards in various benchmarks, such as size, stability, and power consumption. Figure 1. 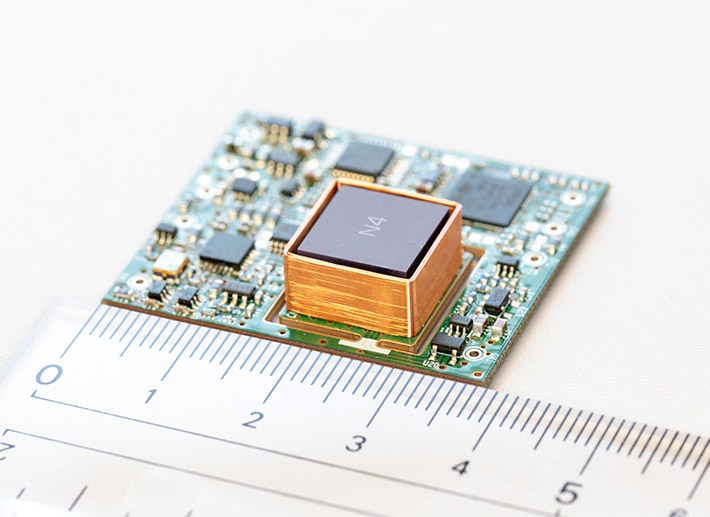 Prototype of the atomic clock (33 mm x 38 mm x 9 mm) A newly developed compact ULPACs, mounted on small satellites, automobiles, and smartphones, accelerate the realization of seamless and on-demand mobile communication networks. As current telecommunication technologies continue to evolve, the speed and sheer amount of data required by users worldwide increase accordingly. One promising method for satisfying this ever-growing demand is by deploying a constellation of nano- or micro-scale satellites that circle the planet in low earth orbit. 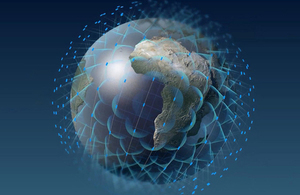 Airbus- Artist’s impression of OneWeb satellite constellation. . However, such a swarm of satellites requires extremely precise synchronization to a global time standard, for which a very precise atomic clock on board each unit is necessary. Because conventional atomic clocks are too large (155–755 cm3) and consume too much power (up to 10 W) to be employed on small satellites, researchers have developed quantum atomic clocks with greatly reduced size and power consumption by employing a method called coherent population trapping. Based on this method, researchers at Tokyo Tech, together with Ricoh Co. Ltd. and the National Institute of Advanced Industrial Science and Technology (AIST), have recently designed a fully functional atomic clock that surpasses the current industry benchmarks. In terms of power consumption, the phase-locked loop of their device, which is an essential component in quantum atomic clocks, consumes an order of magnitude less power than that of previously reported devices. In addition to its low power consumption, the proposed atomic clock outshines currently reported devices in two other critical aspects: volume occupied and Allan deviation. 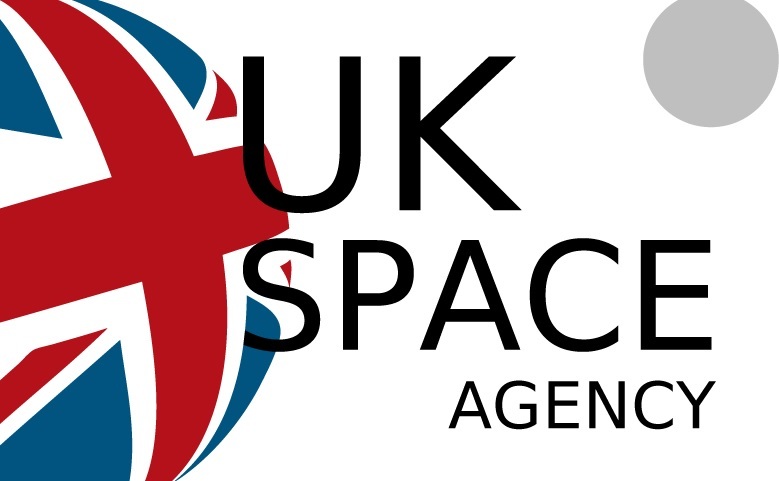 Because effective use of the available space on board nano/micro-scale satellites is of the essence, so is making sure that the final design can be made to fit a very small volume. As for Allan deviation, it is a measure of the stability of the frequency of a clock; a low Allan deviation implies a very stable and reliable clock. The atomic clock developed by the team is also looking good in these two fronts as well. “The prototype of our atomic clock achieves a long-term Allan deviation of 2.2×10−12 at τ=105 s (the industry standard is 3.0×10−10 at τ=1 s) while occupying a volume of only 15.4 cm3 (slightly smaller than the smallest currently available atomic clock),” explains Associate Professor Kenichi Okada from Tokyo Tech. Figure 2. The integrated quantum package. 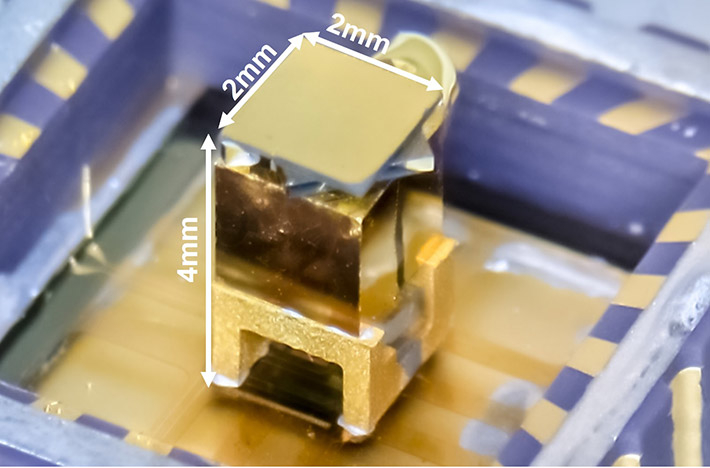 The quantum package of the proposed low-power atomic clock fits in a volume even smaller than the smallest atomic clocks currently available.